Kevin Symonds went to work today on one of the internet spin-meisters for Medjugorje. On his blog Desiderium, Kevin fisks a pretty typical piece written in defense of the dodgy apparition in Herzegovina. I have to wonder if the supporters realize how weak their case is: they seem to have little defense to any critique about the visionaries and their messages. When somebody points to problems at the core of the phenomenon, the defenders rush to distract attention by pointing to “fruits” on the periphery. Once again, my distaste for weekly network TV shows is confirmed. An episode of “Glee” came on — a show I’ve never watched — and the plot is apparently about a threat to abolish the school’s choir. Who do the writers present as the bad guy of the episode? Who wants to do away with the group he formerly starred in? A “Christian” character, of course! 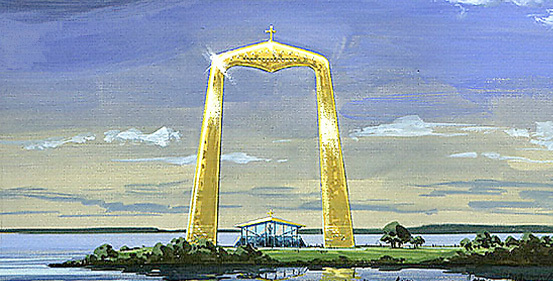 Back in 2002, when this was a brand new blog, I wisecracked about a group of lay people with the ambitious project of building an enormous monument in honor of Our Lady’s Immaculate Heart, in the form of a triumphal arch in Buffalo, overlooking Lake Erie.